Nothing can match the feeling that you get when you hear your infant playing and laughing as he bounces up and down on his jumper. There are no words to describe the happiness and satisfaction that you get knowing that your baby is happy. 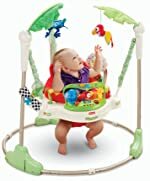 A jumper which also goes by other names like jumperoo and exersaucer will also help keep your infant busy for a few minutes and hence making life easier for you. But, just like with most other baby products, there are many options or types in the market. And so choosing the best one for your precious little one might not always be easy. But, knowing the different jumper types available and what to look for in the best baby jumper will make thing less laborious for you. For most parents, a baby jumper is just something that they use to entertain their kids or keep them busy for some time. But, apart from just putting a smile on the infant's space, this baby product can also have other purposes. One of these purposes and also the most debated ones is helping in leg development. Although parents tend to have varying opinions about this, it is a fact that the dancing, jumping and swinging that the babies do on a jumper require movement of leg muscles. And this helps to strengthen the muscles and hence help in leg development. The right time for introducing your baby to a jumper will depend on his development. And so it is not possible to use months or days to determine this. The simple rule that works for most parents is that if the baby can support his head, he is ready for a jumper. 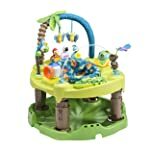 In your quest to find the best exersaucer, it is important to know that they come in different styles. But, the following are the three top baby jumper types. The stationary jumper consists of a frame, elastic cord and comfortable seat for the infant. Stationary jumpers come in a design that resembles a swing hence making it also ideal for use outdoors in the backyard or lawn. Just like the stationary jumpers, the stationary activity will also come with a frame, elastic cord, and seat. But, what makes these jumpers different is that they also include a small tray full of toys. A baby door jumper consists of a seat that suspends from some straps that then attach to bungee style cable. At the top section of the cable, there is a clamp which you use to attach the jumper to the door frame. Knowing the types of baby jumpers or exersaucers available in the market is a significant step. However, with the many options or brands out there it can still be hard to make your pick even when you know the type you want. And so it is imperative to know what to look for when shopping so as to make sure that you get the best baby jumper for your kid. Seats are one of the features that tend to differ a lot from one baby jumper to the other. The seat is a critical feature that you should consider because it determines the comfort of the child and convenience for the parents. The best seats are those that are removable for washing, have some plush padding for extra comfort and also allow the adjustment of height. Regardless of the model or type of jumper that you choose to buy it is vital to make sure that it has a minimum of two or more straps for suspending the seat. Those with one allow the child a free movement and hence increasing the risk of injuries. 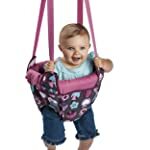 Two or more straps ensure that the child will remain in place when bouncing or playing with the toys. Although the weight limit of a baby jumper will vary from one manufacturer or brand to the other, it is important to go for something that is ideal for your child's weight. And the good thing is that most will always indicate the weight limit. Your baby will only be on the exersaucer for a few minutes every day or a few times a week, and so it will be in storage for most of the time. If you do not have a lot of space at home, it is important to go for something that folds into a compact size because it will not require a lot of storage space. ​A baby jumper is one of the best gifts that you can get for your infant, and the good thing is that it can also help in his development. But, you should always aim at getting the best baby exersaucer from the myriad options available in the market. And with the factors above this should not be a hard for you. However, it is also vital to read baby jumper reviews by other parents and also compare different brands before making your selection.